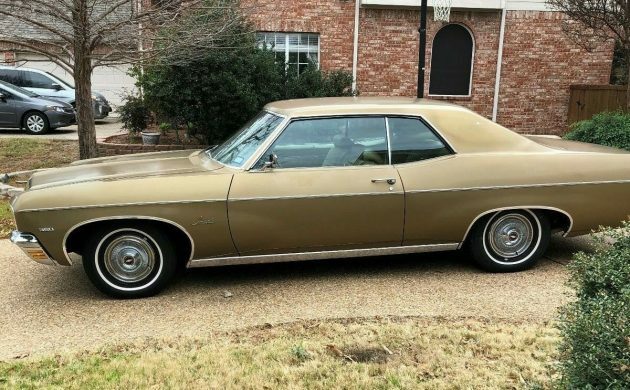 In 1970, Chevrolet and other General Motors makes were wrapping up their full-size models in preparation for a new body style for 1971. Still, there were significant changes from the 1969 model to the front and rear of the car. In 1970 Chevrolet abandoned the full loop bumper they had only used for a year and changed the previously horizontal rectangular triple unit taillights for vertical triple unit taillights. 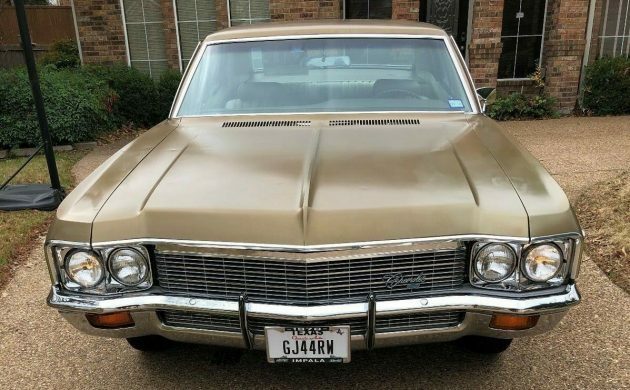 Here is a 1970 Chevrolet Impala Sport Coupe (2 door) for sale here on eBay in McKinney, Texas. This is one of those cars that looks good from 20 feet, but as you get closer you will find its not necessarily as perfect as you first thought. While this Impala benefits from not having a vinyl roof, there are issues with the original gold paint cracking on the sail panel area. It has also been the victim of a hailstorm at some point and the right side passenger door has a dent. Currently, with its third owner, the car’s two previous owners only used the car sparingly, thus the car has only 19,000 miles. The second owner put the car away and it was stored for about 25 years. The tires are about three years old with 5,000 miles of use. The seller shows several detail pictures of the car’s flaws but doesn’t even show an interior picture. Videos of the car are included that show the interior is in great condition. It features gold brocade cloth seats without any rips. The first two owners were from North Dakota, so that means the car has some rust. There is rust on the frame but there does not seem to be any rust on the body anywhere. This is a basically equipped car. It has manual windows and manual drum brakes, but it does have power steering. Being a northern car, it also does not have air conditioning. Also, the fuel gauge is not working. 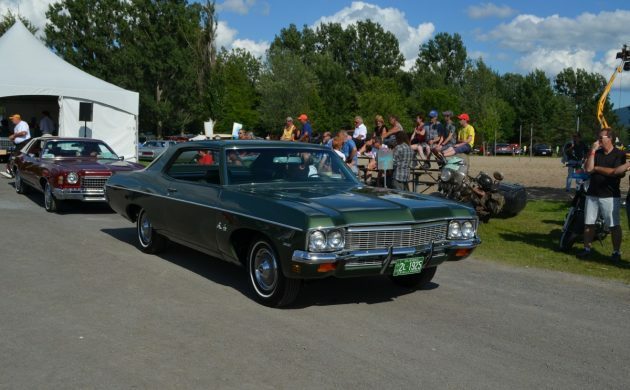 This Impala is powered by a 350 Turbo Fire V-8 engine producing 250 horsepower with 2 barrel carburetor. The radiator has been re-cored and it has a new heater core and air handler. The car also has new shocks. 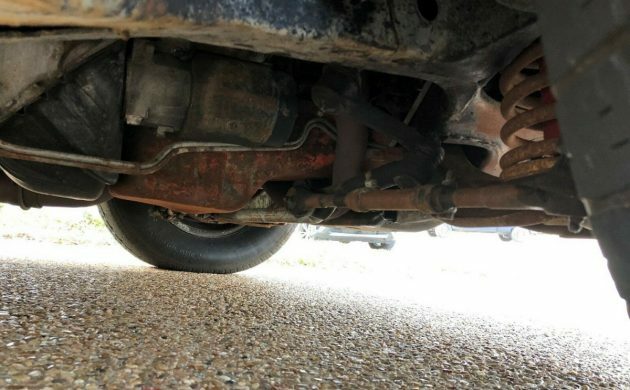 While it only has 19,000 miles, there are several body issues that the next owner may want to address as well as having to live with the rust on the frame. The seller is listing the car for auction but has a Buy it Now Price of $8,999.99. What’s your opinion of this car? Is it something you are interested in? Here we go again, no,,,way,,,Clearly, from the underside shots, it’s a spruced up 119,000 mile car. Still ok, but I wish these people would stop claiming low mileage. The zoom feature kills it everytime. This car has been driven in the snow that many miles. Just say what it really is and drop the price. Without proof, it’s 100k+ miles. What’s nice about this one is the Sport Coupe roofline, seems like most of these had the formal roof with its ugly upright C-pillar. Ask seems twice the realistic amount for such a base model. Try & find a 70 Impala intact!! Since it has a 350 in it easily upgraded . A nice 383 stroker would be nice. Fix the body repaint same color. Makes a nice sleeper. Nice tires with SS wheels & dog dish hub caps. You can spend about 20k with the price of the car! Something bad happened around the back window and sail panels. Stainless trim around the back window doesn’t have that factory fit. This one could be a real mess for the next buyer. Pretty much all GM cars from this era leaked /rotted around the lower rear window area. HowardA is right…the car looks funny for a reported 19K miles. No “C” pillars should have cracking on both sides, prior bondo’ed roof damage? The giveaway is how wavey the trailing right roof edge is….not factory paint for sure. Ditto the right(?) front frame rail, that looks repaired, read, butchered back to “acceptable”, and look at that welding, yikes! This car would need a professional inspection before purchase. This year and model in good shape was a pretty good looking car. Sail panels are deteriorating at the factory lead seams. Car could be 19K original. But was definitely stored in a dirt floor out building for a long time. That’s why the interior soft trim looks good in the video but there’s a fair bit of rust in the bottom side. This was my first car ! Same engine except I had a 4 barrel with a powerglide trans. My car was white with Blk vinyl roof Blk interior! The whole gang fit in it with a huge trunk for two kegs of beer lol. Had it until duty called …..In the Navy…..
My Dad bought a blue on blue vinyl top in 70. Boring but dependable family car. There was no SS trim level in 1970. 1969 was the last year an SS option package was available. It was also the last year bucket seats were offered. Most Impalas and full sized cars in general were ordered with Air Conditioning in 1970. Not in Canada for the A/C! Plus the 69 are very rare with a 427 & hideaway headlights! & No SS emblems on front grill or back. Perfect sleeper! Muscle car magazine had an original owner car feature last year. I don’t want to start a war but I believe the claimed low mileage. 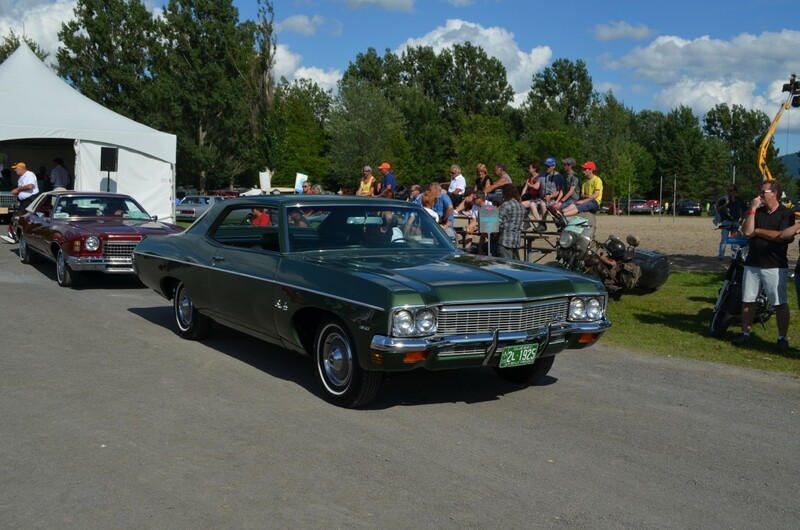 I did restored a similar Chevy to this one, same year and coupe model but in Bel Air line. As I did a frame-off resto, I can recognize every single parts of it. My car did not receive a restoration before I got it, so it was mostly original as this one. My guess is that this Impala had a poor storage in his life. If you look to the youtube video, wheelwells are clean, they don’t have rust as a 119k miles car would have. Wheels opening trims are also clean. Most clamps or clips around the engine are originals, firewall is immaculate. I agree with ACZ as my Bel Air had the same paint problems at each corner’s top. And for the back window, the trim at the bottom seems to be equal to the panel but in fact the groove for it is about an inch lower. Water stays there and it rust. Many GM cars from the era had this problem. Just my 2 cents. My canadian built/sold Bel Air. Gentlemen, I have owned and restored many vehicles, IF the car is an original Texas owned and lived car I might entertain the fact. If you look at the frame, it has undercoating on it, my question is why? Secondly the paint on the hood is a different shade, if it is truly sun fade the patina of the hood and fenders would be pretty close in looks, MB states the chrome around the dash bezels look great and dash has no fading, if it was stored in a garage one could understand, but why would the paint be faded? 19,000 original miles? Why is the oil pan rusted? Please I’m not taking away from it being in great shape, things dont add up to me. Dont forget back in the day unless you bought a car off the lot, you usually had to order one with specifics from the dealer, or get the dealer to install different options you liked. I personally think the price being asked is a decent price. I’d really have to look at the quarters, check the drip rails, the rain channels around the windows. I apologize to the owner if this car is all original, if not dont be a lying mutt, give it straight, if a person likes the car they have a great platform to start with. You’re right on target, MathieuB. You know your craft. Gray paint around the steering shroud and chrome paint around the cluster is still there. Well, it may have seen the 119K miles in a very short time. As I said, ”I believe”. Thank you. A bunch of keyboard jockeys around here that know jack about cars. All the “it’s over a hundred K” guys have never restored a classic and cannot tell the difference between real rust thru rust, and light surfaced rust. A custom coupe would of been nicer than the plain Jain roof of the sport coupe. Still a good looking car. My mother had a Caprice 4dr h/t same colors but much better equipped. One of the best road cars I ever rode in. Rust and wear on the front suspension do not match the motor. Either a newer motor, or someone gave up after trying to refinish the old one. Shots of the interior would help, but its hard to see just 19K miles on the pictures of the front suspension and frame. the damage on the sail panels looks sorta like my father-in-law’s Olds after some less than professional (read: he and I and some Western Auto bondo) attempts to fix hail damage. If the interior looks like 19K, then it could sure be a good start on a nice (but boring) car. One of those three owners liked to hit parking lot bollards or ride up on curbs. Exhaust pipe is crushed, the welding near the bottom of the spring pan means one or both of those got clobbered by something low on the ground. There should be matte black paint in the center of that side molding. On a low mileage car that black would not have worn off, no way no how….. I worked on many of the 60s and 70s chevys in my Dad’s body shop. these cars had a big problem with rust around the back glass. This car has plenty of rust problems and bondo cracks from repairs. The only fix is a complete removal of paint down to the metal, very expensive. I would look for one already done, way less headaches. This one may be ok for a shop owner to buy, but I would stay away. Thats why they put vinyl tops on a lot of 70’s cars they had a lot of window problems. After looking at the paint, the under side, the rust, and the excessive wear on the bushings I would hope no one would fall for the 19k claim. This is $3000 car all day long. 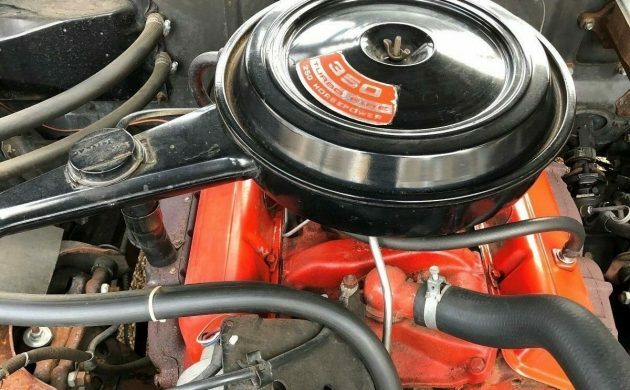 Anything on the motor can be replaced with new old stock, or cleaned up. No pictures of the clean interior that would prove 19K. miles. I wonder why? I know from experience odometers can be replaced or rolled back in less than 2 hours. I buy nothing based on mileage, unless it is documented. Buyer beware, if they take the sellers word for mileage, without proof. Also, low mileage cars can have many problems, from setting all those years. Check the second YouTube video for the clean interior. It’s really nice.